Barcelona moved two points clear at the top of La Liga on Saturday after riding their luck to come from behind and win 2-1 at Real Sociedad on Saturday while Real Madrid could only draw 1-1 in a highly entertaining game at Athletic Bilbao. They then survived a mini onslaught from the home side in the second half before Luis Suarez levelled in the 63rd with a scrappy goal and Ousmane Dembele gave them a barely deserved lead three minutes later. The fightback follows Barca’s 4-2 win at Anoeta last January and makes them the only team to still have a perfect record in Spain’s top flight, where they lead the standings with 12 points, two clear of Real. Visiting coach Ernesto Valverde decided to start his side’s arguably least favourite away trip without Philippe Coutinho and Sergio Busquets ahead of a jammed schedule of six games in 20 days. That gamble appeared to have backfired when Elustondo smashed home following a knock down from a corner. 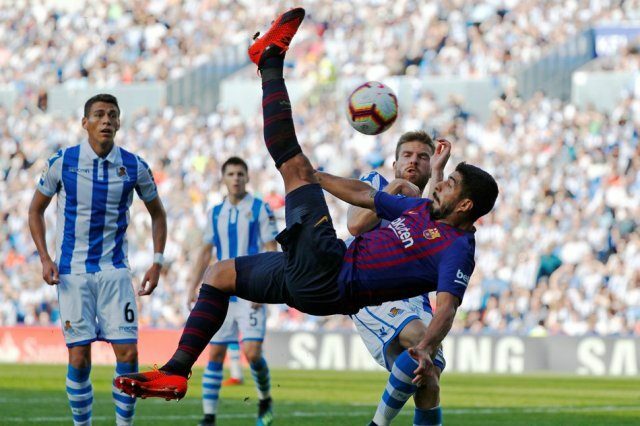 Valverde brought on Coutinho and Busquets early in the second half but their presence initially made little difference as Real Sociedad launched three counter attacks in quick succession, with only the presence of German goalkeeper Marc-Andre ter Stegen preventing the home side from doubling their lead. The Catalans took the lead following another set piece, Dembele sending the ball skidding in after goalkeeper Geronimo Rulli had flapped at a corner and left his net unguarded. “I think you have to see a game like this to see how tough La Liga is,” said Suarez. Iker Muniain gave Athletic a deserved lead in the 32nd minute in Bilbao by bundling the ball home after Real failed to get back in time to defend a counter attack. Real were twice denied by Athletic’s impressive 21-year-old goalkeeper Unai Simon in the first half but finally beat the youngster when Isco nodded home a cross from Gareth Bale in the 63rd minute as Real improved after bringing on midfield anchor Casemiro at the start of the second half. “This is a very difficult ground to come to, for the team they have and for how they play. They come looking for you, they press you man-for-man and make life hard for you and if you don’t find ways deal with that it’s tough,” said Real coach Julen Lopetegui.